Not to be confused with Decertification. Desertification is a type of land degradation in which relatively dry area of land becomes increasingly arid, typically losing its bodies of water as well as vegetation and wildlife. It is caused by a variety of factors, such as through climate change and through the overexploitation of soil through humankind's undertaking. 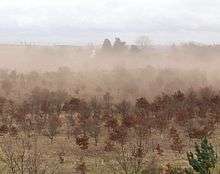 When deserts appear automatically over the natural course of a planet's life cycle, then it can be called a natural phenomenon; however, when deserts emerge due to the rampant and unchecked depletion of nutrients in soil that are essential for it to remain airable, then a virtual "soil death" can be spoken of, which traces its cause back to human overexploitation. Desertification is a significant global ecological and environmental problem. The impact of global warming and human activities are presented in the Sahel. In this area, the level of desertification is very high compared to other areas in the world. All areas situated in the eastern part of Africa (i.e. 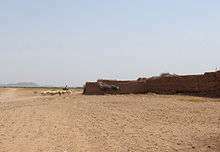 in the Sahel region) are characterized by a dry climate, hot temperatures, and low rainfall (300-750 mm rainfall per year). So, droughts are the rule in the Sahel region. Some studies have shown that Africa has lost approximately 650 000 km² of its productive agricultural land over the past 50 years. The propagation of desertification in this area is considerable. Some statistics have proved that since 1900, the Sahara has expanded by 250 km, covering an additional area of 6000 square kilometers. The survey, done by the research institute for development, had demonstrated that this dryness is spreading fast in the Sahelian countries. desertification in the Sahel can affect more than one billion of its inhabitants. 70% of the arid area has deteriorated and water resources have disappeared, leading to soil degradation. The loss of topsoil means that plants cannot take root firmly and can be uprooted by torrential water or strong winds. The immediate cause is the loss of most vegetation. This is driven by a number of factors, alone or in combination, such as drought, climatic shifts, tillage for agriculture, overgrazing and deforestation for fuel or construction materials. Vegetation plays a major role in determining the biological composition of the soil. Studies have shown that, in many environments, the rate of erosion and runoff decreases exponentially with increased vegetation cover. Unprotected, dry soil surfaces blow away with the wind or are washed away by flash floods, leaving infertile lower soil layers that bake in the sun and become an unproductive hardpan. Controversially, Allan Savory has claimed that the controlled movement of herds of livestock, mimicking herds of grazing wildlife, can reverse desertification. At least 90% of the inhabitants of drylands live in developing nations, where they also suffer from poor economic and social conditions. 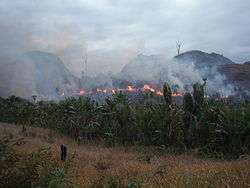 This situation is exacerbated by land degradation because of the reduction in productivity, the precariousness of living conditions and the difficulty of access to resources and opportunities. One less difficult solution that has been proposed, however controversial it may be, is to bring about a cap on the population growth, and in fact to turn this into a population decay, so that each year there will gradually exist fewer and fewer humans who require the land to be depleted even further in order to grow their food. Proponents of this solution claim that this would put the economy into dire straits, however many unemployed people (estimated at approximately 592,398,142 when the average unemployment rate in 2016 (8 percent) is applied to the recorded global population of 7,404,976,783) already exist who could rise up to the duty of filling jobs. Some soils (for example, clay), due to lack of water can become consolidated rather than porous (as in the case of sandy soils). Some techniques as zaï or tillage are then used to still allow the planting of crops. Another technique that is useful is contour trenching. This involves the digging of 150m long, 1m deep trenches in the soil. The trenches are made parallel to the height lines of the landscape, preventing the water from flowing within the trenches and causing erosion. Stone walls are placed around the trenches to prevent the trenches from closing up again. The method was invented by Peter Westerveld. Enriching of the soil and restoration of its fertility is often done by plants. Of these, the Leguminous plants which extract nitrogen from the air and fixes it in the soil, and food crops/trees as grains, barley, beans and dates are the most important. Sand fences can also be used to control drifting of soil and sand erosion. Managed grazing methods are argued to be able to restore grasslands. Restoring grasslands store CO2 from the air into plant material. Grazing livestock, usually not left to wander, would eat the grass and would minimize any grass growth while grass left alone would eventually grow to cover its own growing buds, preventing them from photosynthesizing and killing the plant. A method proposed to restore grasslands uses fences with many small paddocks and moving herds from one paddock to another after a day or two in order to mimic natural grazers and allowing the grass to grow optimally. It is estimated that increasing the carbon content of the soils in the world’s 3.5 billion hectares of agricultural grassland would offset nearly 12 years of CO2 emissions. Allan Savory, as part of holistic management, claims that while large herds are often blamed for desertification, prehistoric lands used to support large or larger herds and areas where herds were removed in the United States are still desertifying. ↑ Mayell, Hillary (April 26, 2001). 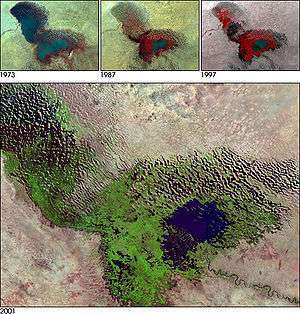 "Shrinking African Lake Offers Lesson on Finite Resources". National Geographic News. Retrieved 20 June 2011. ↑ "Sustainable development of drylands and combating desertification". Retrieved 21 June 2016. ↑ "The Desert Will Win". FIGU-Landesgruppe Canada. Retrieved 2016-11-20. ↑ "define:desertification - Google Search". Retrieved 21 June 2016. ↑ "Part I". Retrieved 21 June 2016. ↑ Mortimore, Michael (1989). Adapting to drought: farmers, famines, and desertification in west Africa. Cambridge University Press. p. 12. ISBN 978-0-521-32312-3. 1 2 LOWDERMILK, W C. "CONQUEST OF THE LAND THROUGH SEVEN THOUSAND YEARS" (PDF). Soil Conservation Service. United States Department of Agriculture. Retrieved 9 April 2014. ↑ Bogumil Terminski (2011), Towards Recognition and Protection of Forced Environmental Migrants in the Public International Law: Refugee or IDPs Umbrella, Policy Studies Organization (PSO), Washington. ↑ Geist, Helmut. "The causes and progression of desertification". Antony Rowe Ltd. Ashgate publishing limited. Retrieved 6 July 2013. ↑ Dregne, H.E. "Desertification of Arid Lands". Columbia University. Retrieved 3 December 2013. ↑ "Sun, Moon and Telescopes above the Desert". ESO Picture of the Week. Retrieved 30 April 2012. ↑ World Bank (2009). Gender in agriculture sourcebook. World Bank Publications. p. 454. ISBN 978-0-8213-7587-7. ↑ Riebeek, Holli (2007-01-03). 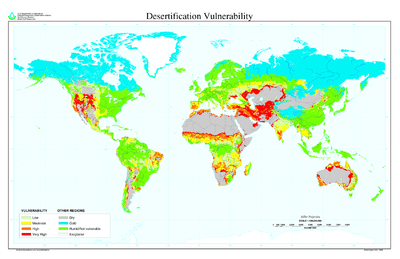 "Defining Desertification : Feature Articles". earthobservatory.nasa.gov. Retrieved 2016-11-30. 1 2 3 4 "La progression du désert du Sahara augmente chaque année ?". Savezvousque.fr. Retrieved 2016-11-30. 1 2 "United Nations Convention to Combat Desertification: Issues and Challenges". E-International Relations. Retrieved 2016-11-30. ↑ Klausmeier, Christopher (1999). "Regular and irregular patterns in semiarid vegetation". Science. 284 (5421): 1826–1828. doi:10.1126/science.284.5421.1826. ↑ (www.dw.com), Deutsche Welle. "Grid of straw squares turns Chinese sand to soil - Environment - DW.COM - 23.06.2011". Retrieved 21 June 2016. ↑ Savory, Allan. "Allan Savory: How to green the world's deserts and reverse climate change". ↑ Savory, Allan. "Holistic resource management: a conceptual framework for ecologically sound economic modelling" (PDF). Ecological Economics. Elsevier Science Publishers. Retrieved 10 March 2013. ↑ Butterfield, Jody (2006). Holistic Management Handbook: Healthy Land, Healthy Profits, Second Edition. Island Press. ISBN 1559638850. ↑ Savory, Allan. "Response to request for information on the "science" and "methodology" underpinning Holistic Management and holistic planned grazing" (PDF). Savory Institute. Retrieved 10 March 2013. ↑ Drury, Steve. "Large-animal extinction in Australia linked to human hunters". Earth-Pages. Retrieved 9 June 2014. ↑ Dobie, Ph. 2001. “Poverty and the drylands”, in Global Drylands Imperative, Challenge paper, Undp, Nairobi (Kenya) 16 p.
↑ Briassoulis, Helen (2005). Policy integration for complex environmental problems: the example of Mediterranean desertification. Ashgate Publishing. p. 161. ISBN 978-0-7546-4243-5. ↑ "The Future Of Mankind - A Billy Meier Wiki - Overpopulation Crusade". www.futureofmankind.co.uk. Retrieved 2016-11-20. ↑ Briassoulis, Helen (2005). Policy integration for complex environmental problems: the example of Mediterranean desertification. Ashgate Publishing. p. 237. ISBN 978-0-7546-4243-5. ↑ For example, Eden Reforestation Projects website, on Vimeo, on Eden Reforestation Projects on YouTube. 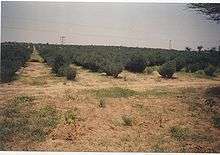 ↑ This article incorporates public domain material from the United States Government document "http://pubs.usgs.gov/gip/deserts/desertification/". ↑ "Drylands Restoration Initiative". Food and Agriculture Organization of the United Nations. Retrieved 14 April 2016. ↑ "Our Good Earth - National Geographic Magazine". Retrieved 21 June 2016. ↑ "Home - Justdiggit". Retrieved 21 June 2016. ↑ "Département Biologie Végétale - Laboratoire Commun de Microbiologie IRD-ISRA-UCAD". Retrieved 21 June 2016. ↑ "LCM - Laboratoire Commun de Microbiologie". Retrieved 21 June 2016. ↑ "Sprouting Trees From the Underground Forest — A Simple Way to Fight Desertification and Climate Change – Water Matters - State of the Planet". Blogs.ei.columbia.edu. 2011-10-18. Retrieved 2012-08-11. 1 2 "How cows could repair the world". nationalgeographic.com. March 6, 2013. Retrieved May 5, 2013. 1 2 3 "How fences could save the planet". newstatesman.com. January 13, 2011. Retrieved May 5, 2013. ↑ "Restoring soil carbon can reverse global warming, desertification and biodiversity". mongabay.com. February 21, 2008. Retrieved May 5, 2013. ↑ Abend, Lisa (January 25, 2010). "How eating grass-fed beef could help fight climate change". time.com. Retrieved May 11, 2013. Mensah, Joseph (2006). "Desertification". In Leonard, Thomas M. Encyclopedia of the developing world, Volume 1. Taylor & Francis. ISBN 978-0-415-97662-6. Bell, Trudy; Phillips, Tony (December 6, 2002). "City-swallowing Sand Dunes". NASA. Retrieved 2006-04-28.